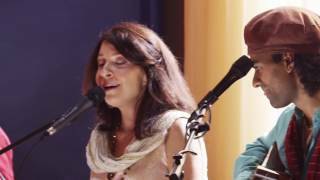 Gina Salá is a vocalist, composer, teacher and kirtan leader with a repertoire spanning 23 languages and performance credits including the UN, Cirque du Soleil, festivals, universities and huts. She began chanting in her early childhood years age living in a Hindu ashram and has deepened her practices in extended time living in the Himalayas, a Buddhist monastery and in India with her teachers, Vagish Shastriji, Pt. Ritwik Sanyal and others in sanskrit, mantra, sound tantra and classical Indian singing. With warmth, humor and devotion, she offers voice training, mantra, stories and sound tantra in classes, cds, kirtans, and retreats, including an annual “River of Sound” tour to India. Her passion is helping us sing ourselves awake to Who we are.